Truly a property to be treasured by many generations – one of Orlando’s best waterfront estates! This stunning “soft” contemporary was custom built and designed for this particular 2.62 Acre location, taking full advantage of an “endless” deep-water view of Lake Butler on the famed Butler Chain of Lakes in Windermere where you can boat through 8 lakes. Truly one of the most sought-after locations in Central Florida. This property offers a comfortable, yet exciting, resort environment as a family compound or a corporate retreat. The main house has 4 bedrooms, a handsome home-office and a game room overlooking the lake. The floor plan embraces a tropically landscaped heated swimming pool and spa, which is framed by a spacious tiled Terrace, all of which is screen enclosed. The Terrace steps down to the pool area and offers a generous decking area for entertaining. The interior has soaring ceilings and glass windows and doors which span the entire rear of the residence and allow you to enjoy this beautiful lakefront view from all living areas. The coloration of the interior is delightful in its use of primary colors which have been professionally coordinated. 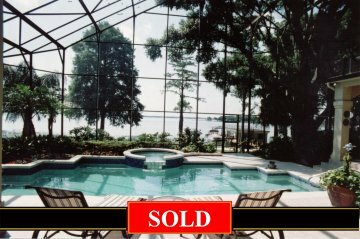 All bedrooms and home-office are located on the first floor, including the Master Suite which has a direct lakefront view. A lakefront Game Room is located on the second floor. An oversized 4-car Garage is attached to the residence. • Fully furnished, professionally decorated.